This week has disappeared… I had a migraine cluster that started last week and lasted 3 days, add to that poor sleep all week and somehow it’s already Friday. I wanted to work more on the 12 days of 3Zs, but all I’ve been able to accomplish this week is a little zentangle for I am the Diva’s Weekly Zentangle Challenge. The Diva’s weekly challenge has been going for six years now, and she gave us the option to do one of the past years’ challenges for this week. I chose ‘Merry Happy‘, because for me this time of year isn’t about a specific religious holiday (we are not religious), or about the gifts (we don’t exchange gifts either), for me it is about the lights and decorations and spending time with my family. 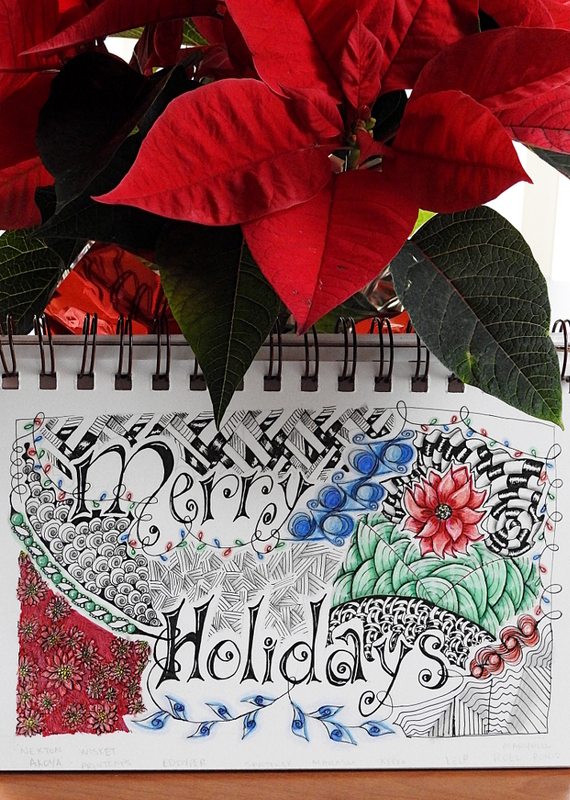 So I decided to play with the words Merry Holidays and do zentangle patterns that kind of look like lights. I chose patterns: Akoya, Eddyper, Kelp, Roel, and Ponio for the lights; and Nekton, Wisket, Printemps, Shattuck, Marasu, Keeko, and Maryhill for the filler patterns. I also added a poinsettia-like pattern as well, Laflor. I got the idea for the lettering here. This entry was posted in about, Nikon CoolPix P900, pen/paper, tangle, zentangle. Bookmark the permalink. I do like your merry Hollidays and wish you too a merry Christmas and a happy New Year! Your Merry Holidays page is beautiful! I love the color, the lights and Laflor. I hope you are feeling better. Merry Holidays to you and Happy New Year! Happy tangling! Beautiful Merry Holidays! Love it! I like this, your lettering is also great. Hope you will have a great time with your family, surrounded by lights!